Pumpkin, it’s not just for pies for pity sake. 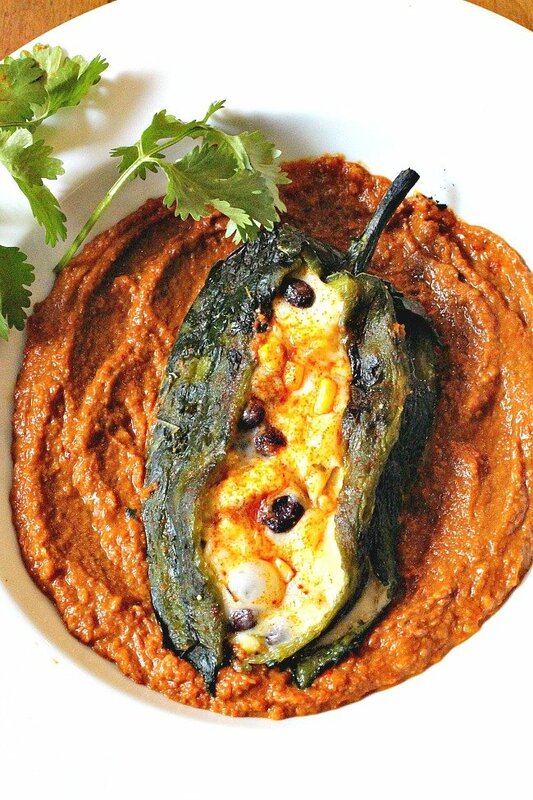 How about this roasted poblano pepper filled with two cheeses, corn and black beans, sitting on a bed of pumpkin mole. Now that equals ole’. Mole has been on my “things to make” list for years. And the reason I’ve not made it sooner is simply due to the intimidation that a good mole should take all day with hours of stirring to achieve that famous complex flavor. And from everything I’ve read, one should really take the time to master this dish of Mexican tradition. Why? Well, because it’s mole. Being a mole novice, I’ve started out with an afternoon project rather than a three day extravaganza and I must say, this pumpkin mole recipe was a hit when it reached our dinner table. 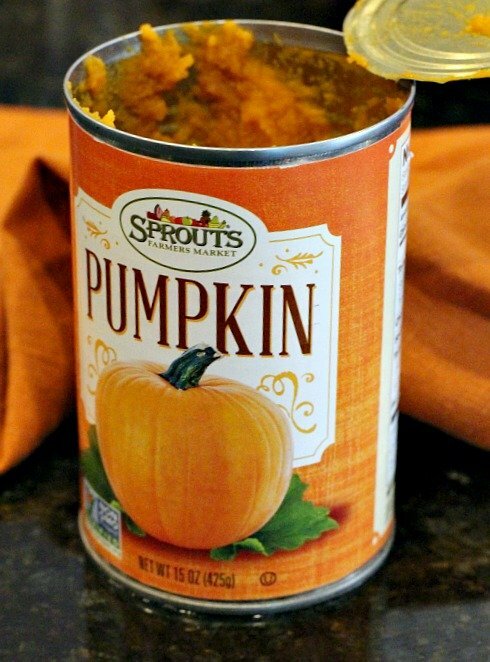 Simplifying this recipe started with using canned pumpkin puree from Sprouts Farmer’s Market. Sprouts has officially jumped into the Fall season and has their shelves stocked with pumpkin e-v-e-r-y thing. I’m sipping on their pumpkin flavored coffee as I type. Don’t let the long list of ingredients scare you. Once you’ve blended the mole ingredients in the food processor, everything comes together in a very manageable amount of time. The result? smoky, sweet, spicy, rich, chile-chocolate pumpkin sauce. 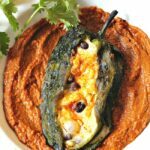 Topped with a roasted poblano pepper filled with cheesy goodness, this is an irresistible dish and a very manageable recipe for Mexican mole. So don’t be afraid, it’s only mole. Looking for more pumpkin recipes? Take a look at Sprouts Farmer’s Market Recipe Page. It’s loaded with all kinds of Fall goodness recipe ideas. Sweet, smoky, spicy. 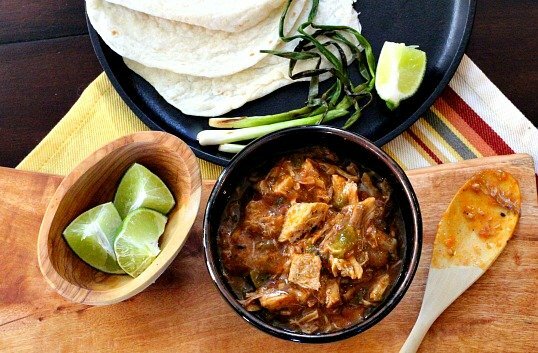 Mexican Pumpkin Mole. In a medium sauce pan, heat the water. Add the guajillo peppers and soak for 30 minutes. Remove the chiles from the water, cut the tops off and with fingers tear open and remove seeds. Heat a fry pan over medium high heat and add oil. When oil is hot, add onion and cook for about 5 minutes. Add whole smashed garlic and cook until fragrant. About 2 more minutes. In a food processor add the guajillo peppers, corn tortillas, onion, garlic, salt, peanut butter, oregano, thyme, chicken stock, canned pumpkin, and chile powders. Process until well mixed. Taste and adjust for seasoning and salt. Return the mole mixture back to pan and cook on medium low for 30 minutes, stirring often. Stir in chocolate at the last minute and heat until melted. Roast poblano peppers by placing them on a sheet pan under broiler. Broil for 3 minutes per side until skin is charred. Turning 4 times with tongs. After the poblanos are charred, place in a plastic bag for 5 minutes. Remove charred skin with fingers. Do not rinse with water. Make a slit down each pepper and carefully remove seeds. Return to sheet pan. Prepare the cheese by cubing and crumbling, set aside. In a pan, melt the butter. Add the corn and the black beans. Sautee until the corn is starting to brown. In a bowl combine the corn, beans and cheese. Stuff the poblanos with the cheese mixture. Broil until melted and starting to toast. To serve, spoon the mole into the bottom of a wide shallow dish. Place the broiled pepper in the middle. Sprinkle with smoked paprika for garnish and flavor. Note, any Mexican market or good spice shop will have the Mexican Chile powders. If you can't find them use a good quality chile powder and your favorite hot sauce for the heat. 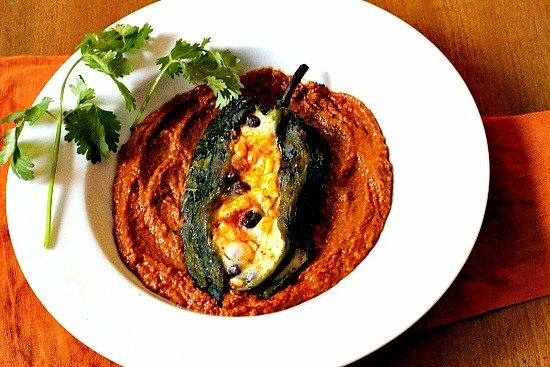 Stuffed Chile Poblanos with Pumpkin Mole … It’s What’s for Dinner. This post is sponsored by Sprouts Farmer’s Market. All opinions are my own. Lea Ann, what a beautiful, no, stunning dish! This looks like something I need to make in the next month or so. Excuse me, I have to cut this short and go back and look at the photo! Thank you Jean. My husband couldn’t quit bragging about it. Really neat dish! Love mole anything, and this is a much more sensible recipe than many I see — much simpler. Which suits me to a T. 🙂 Good stuff — thanks. Thanks John. My little favorite Mexican Restaurant serves a mean Mole, and I really want to try the darker version soon. 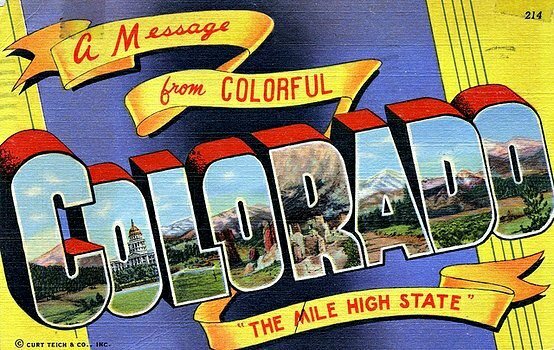 One of these snowy days might be the ticket. Oh I bet this is delicious Lea Ann, we love dishes like this with lots of flavor. Beautiful presentation too! Can’t wait to try it. Love pumpkin, love mole…it’s a no brainer. I too have always been sort of intimidated by mole. Not any more! This looks divine, Lea Ann. A lot of great flavors. I’d be happy to eat this. Wow! I’ve never even had mole much, but this looks amazing to me! Love the pumpkin idea.